Policy making in complex societies is often challenging. Societies are changing, the pace of change is steadily increasing, and policy makers are constantly required to devise policy solutions for increasingly complicated problems. The purpose of our Executive Education Programs is to provide policymakers with the tools and the skill-set they need to tackle the complex issues in a dynamic world. By participating in our programs, public sector professionals become stronger leaders, effective managers and highly capable policy makers. 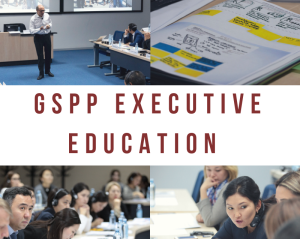 Our international faculty, integrated approach and commitment to promote development through good governance make the Graduate School of Public Policy the ideal learning environment for policy makers and leaders in Central Asia. Participants will receive a certificate at the end of each program. Executive Education Programs for 2019.